What desk chair did Steve use? Discussion in 'Community Discussion' started by lwood1, Jan 18, 2012. Anyone know what desk chair Steve used? Also curious as to what you guys would recommend. I have an older Steelcase Leap. It's one of the most comfortable ones I've found. Whatever you get, make sure it has adjustable armrests if you have to sit a lot. It can take a lot of strain off your elbows and shoulders if they're setup up correctly. I use the Eames EA 219. Anyone who suggests anything without aluminum armrests should be shot in the head. Especially that Aeron and related plastic crap with no class. I guess it works for you, but that looks like the most uncomfortable thing ever. EDIT: Curious...why are aluminum armrests so important? 2. Plastic gets really crappy and sloppy over time and looks like ish. The metal leaves a nice cool impression on year arms when it's felt. In the mornings, it's cold, which is really nice. And, it only takes two seconds to wipe and look totally fresh. Plastic is just a horrible material. Nice supple leather is where it's at. They remind me of the toilet seat in the middle of a winter night; extremely cold to touch at first, but once you're on for a few seconds it warms up nicely. I bought my Herman Miller Aeron chair in 1999. I still have it today. In 2008 an armrest broke off. It was STILL under warranty (12 years!) and they paid shipping both ways to repair it. Good as new. I highly recommend this chair to any one who finds it comfortable. It's a bit expensive but it will likely be the last office chair you ever buy. I have several Aeron chairs in my office, one of them 15 years old and still looking and functioning as good as the newer ones. Another vote here for the Aeron. I bought mine a couple of years ago on Craigslist for something like $350. Absolutely love it. I think the winner is clear. Sorry, but my $40 IKEA junk chair with plastic armrests does the job just fine and looks just fine. Who knew MR would have chair snobs who sit around and criticize other people because they didn't waste a bunch of money on an overpriced, "name brand" chair. 2. Plastic gets really crappy and sloppy over time and looks like ish. Maybe for people who are oily slobs who never shower with caustic skin. I've used chairs with plastic arms on them for years and none of them have ever looked like crap, even after years of use. I never cared about plastic vs aluminum or whatever, but some things are quite useful. There are a number of lesser known brands that aren't as expensive. What matters if you have to sit for a number of hours in a week is having something that allows for a good sitting position. You don't want a chair that pushes your shoulders up or leaves hard plastic underneath your elbows. Most of the really cheap ones aren't recommended for if you work at your desk full time. I'm not a snob about it. Switching killed some annoying shoulder soreness. The old one had fixed armrests that were too high. I can agree with that, but I think everyone can find something pretty comfortable for far less than the thousands some of these "designer" chairs go for. Personally I find spending $1000+ on something that says Herman Miller is a colossal waste of money, as I can't see a $50 chair being so agonizing that a $1000 chair is literally 20 times the value in terms of comfort. Likewise, I think spending $2000 on a Kirby vacuum is also a waste of money when you could buy a $100 vacuum and use it every day, and just get new carpet somewhere along the line and get the benefit of an update. To each their own. But to say that anyone with a plastic arm chair should be shot in the head is asinine. My cheap leather chair is awesome and looks good, and chairs just as good as the next chair and it only cost me about an hours' worth of time if I were an hourly worker. When I hear people complain about how wretched sub-$1000 chairs are (which seems to come up monthly or bi-monthly here), I can't help but think, how would those people have ever survived in generations past? Then again I'm also 130 lbs, so I don't have to worry about crushing cheap chairs under my body weight. I don't think things have to be such polar opposites here. To clarify I'm not a huge fan of the herman miller chairs, I don't weigh enough to crush chairs, and aesthetics are a secondary concern for me. I had a cheap chair for some time. I would work out before or after doing whatever work (at my desk). That combined with bad armrest position contributed to some minor shoulder issues. I found a cheap price on a much nicer (technically used but didn't look like it) Steelcase Leap. The pain went away, as it didn't pressure my shoulders upward like the older one. There are some really well manufactured chairs that do sell for quite a lot. Really a lot of it comes down to how many hours you'll spend sitting there in a given week. 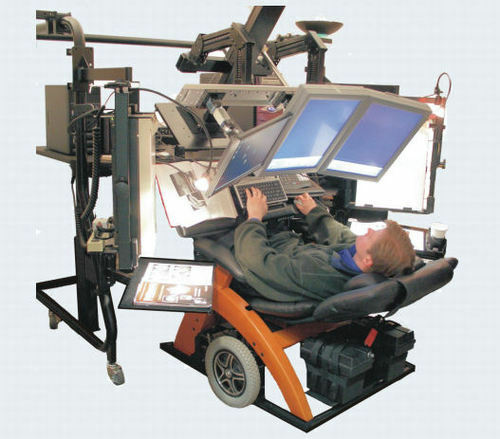 The ergonomics can make a difference in the long term, and it doesn't necessarily have to cost $1000. Take it as you will. In my case a better chair actually did a superior job even though I was well within the weight limit of the old one. By the way, I wouldn't actually suggest one with aluminum armrests. I'd suggest something with adjustable armrests so they can be set to a comfortable height. Arms made out of hard unyielding material can also put pressure on the ulnar nerve, but none of this stuff is really of much concern unless you need a chair suitable for a lot of hours per week. Sure, you can waste your life an a 40 USD chair, if you wish, but I'm in a position to not have to do that. I guess that I can't expect a peasant to understand wht the Eames actually accomplished. But, for future reference, you should actually understand why they did what they did and what was accomplished before being so dismissive. One last thing, who benefits from you buying your craptastic 40USD IKEA? No one, in fact. When I spend 2000€ on an Eames Executive Chair from Vitra, new designers are supported by the a percentage of the profit, which will result in the next generation of furniture design. One last thing, who benefits from you buying your craptastic 40USD IKEA? No one, in fact. When I spend 2000 on an Eames Executive Chair from Vitra, new designers are supported by the a percentage of the profit, which will result in the next generation of furniture design. Peasant and dismissive, in the same paragraph. Nice juxtaposition there. If his $40 chair is not deleterious to him in any way, whey should he spring for a more expensive one? It's not unlike a Timex and a Rolex. They both work well. I'm wondering why you care what chair Jobs used. Does his using a particular chair make it better? Is your tush exactly the same as his? Does knowing Jobs used a particular chair mean it must be comfortable for you? And how about his brand of toilet paper. Better because he used it? Is the idea that if you used stuff Jobs used, it will make you just like him? You need to get over yourself. Not everyone is going to know what both of them did in their lifetime outside of what they learn from wikipedia. Sometimes it takes a very long time to really embrace their contributions but more so to embrace the importance of a good chair. While a good chair wouldn't have saved my back injury, it would have probably helped me along the way. The cost of my surgery could easily buy a couple Eames desk chairs, a lounge chair and maybe a couch if I include the cost of PT. Just because someone is ok with a $40 chair from Ikea doesn't mean they're "wasting their life" on it. It also doesn't mean they're dismissive of the quality brought by the name. But say someone is, how does it really hit your bottom line? FWIW, you can buy a cheaper chair that has a lot of the features the Eames chair has and it will adjust pretty well to many body types; however, it will not stand the test of time. I've had many chairs that haven't even survived the gorilla hands of movers but I would suspect an Eames chair to stand up to a little abuse. You haven't been here long have you? I've never been on a forum where more money is spent on possessions of higher quality where a cheaper and similar functioning item is available; outside an AV forum of course. Maybe he's building a Steve Jobs suit, and wants to sit in the chair in front of a Mac for the full Jobs experience. Maybe he's just curious and you kids can relax and let the guy wonder. Look here, kid. I'm sorry that I don't feel the need to brag about how much money I'm throwing away on a frakin' chair. I'm also sorry that I didn't come here specifically to make myself feel better by bashing other people.